SKU: N/A. Category: Key Tags. Tags: B&B KEY RING, ENGRAVED KEY RING, HOTEL KEY TAG, KEY RING. 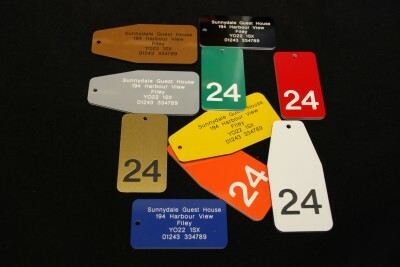 Large hotel or guest house key tag with hole to attach to a key ring or ball chain. These are too large for people to forget they have them! Very rigid 3mm thick 3 ply plastic. For bulk purchase please use the contact page advising on how many you would like and we will provide you with a quote.